Last week’s Music and Drama Education Expo was a bustling hub of activity and networking for music and drama teachers from around the world and so the perfect event for Black Cat Music to set up shop to exhibit their top selling products. 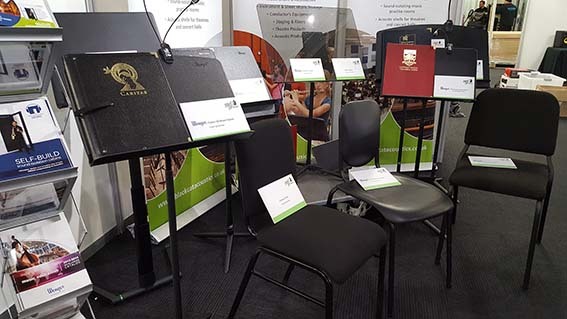 On show at the Black Cat stand were the ever-popular music and performance products ranging from Wenger music stands and music posture seating to staging, conductor’s equipment, choir and band folders. Black Cat Music and Acoustics’ managing director, Alice Dagger and sales executive, Brigitte Downs, were in position and on hand to give sound advice on their top-selling music practice rooms. Reporting on the excellent turnout of this year’s event, Alice Dagger said “The Expo was more popular than ever and we saw a great many familiar and new faces in the world of music and drama education. It’s been a very busy but highly enjoyable few days”. Brigitte Downs added: "We were very pleased with the popularity of our Conductor's Baton offer and it was great to see lots of old friends as well as introducing new music teachers to Black Cat's range of top quality music education and performance equipment." Black Cat Music is proud to be Exclusive UK Distributor for Wenger Corporation. Wenger is world-renowned for the quality and longevity of its products, which come with a minimum 5-year warranty. The Black Cat team matches the quality of its products with the quality and care of the services provided to our customers.